Frito-Lay sent me some of their very popular kinds of chips for free for review. 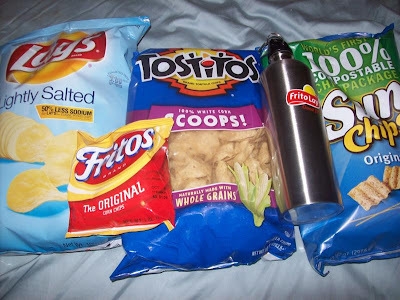 I was sent the SunChips, Lays Potato Chips, Fritos, Tostitos, a coupon for a free bag of chips, and an awesome metal water bottle. Of course I have tried all of these products before but I never tried the lightly salted Lays. I tried them thinking that they would have less flavor than the regular Lays but I was wrong. They tasted exactly the same. This is good for people who have to watch their sodium intake or like me, who just likes to eat a lower salt diet. Even though these products are not very nutritionist friendly, I believe that ALL foods are good in moderation. I love all of these chips too! Especially the Tostitos with some salsa! Yum! The giveaway will be for this same prize pack that I received including Sunchips, Fritos, Tostitos, Lays, a water bottle, and a coupon for a free bag of chips! The giveaway is open until Midnight on Tuesday September 14th. Winner will be chosen on Wednesday September 15th using Random.org. This is open to U.S. residents only. Tell me which Frito Lay product is your favorite! I like Lays and Fritos! My favorite item is their chili cheese chips. Tostitos are definitely my favorite Frito Lay product. I found your blog through google blogsearch. The original corn chips are my favorite! Sunchips sunchips sunchips! totally my favorite! Found your site through Ten Talents...'s Low Entry Lowdown! Found you on Ten Talents. Wow this is hard cause I love them all. But I really love tostitos. So yummy with salsa! I love the salsa con queso! sun chips are my favorite. I found your blog in ten talents. My favorite is cheddar and sour cream! I found your giveaway on Ten Talents! found your site through Low Entry Lowdown. I subscribe to your blog via GFC. I love the extra loud sunchips. I love the Baked Tostitos! I love the Sun Chips! Thanks! I found your site through Ten Talents. I love the salt and vinegar chips! Yum. I found your giveaway on low entry low down at ten talents blog. The tostitos are definitely my favorite! DORITOS LATE NIGHT TACOS AT MIDNIGHT Flavored Tortilla Chips are my favorite! My favorite is the chili cheese fritos, yum! We are all fans of Sun Chips here! Thanks so much for the chance to win this great prize pack! I entered GU Energy giveaway. Fritos are my absolute favorite Frito Lay product. I love putting them in the microwave with cheese all over them. Tastes just like Nachos, that I would order in a restaurant. My favorite is the Lays salt and vinegar. Doritos Nacho Cheese are my favorite! I just subscribed to this blog via email. I found your site via Ten Talents low entries list post. I entered your Just Argan Natural Oil Giveaway. We love the scoops...they are great for my home-made dips!